I have worked in the auto glass industry as a glass installer for about 20 years. We have operated our NOVUS Franchise for about six months. I have only one regret. I wish I had opened my franchise with NOVUS many years ago. Yes, I could have started my own independent glass shop, based upon my experience in the industry. But I wanted the added brand recognition and support programs offered by an established company like NOVUS Glass. I was an employee of a NOVUS franchisee in South Dakota and had the desire, motivation and support to buy my first franchise in Colorado in 1996. Being in my early 20s I had a lot to prove to myself and my customers. We were honored with the NOVUS ‘Rookie of the Year’ Award our first year in business. We have made lifelong friends with so many of the NOVUS franchisees. I could not imagine doing anything in my career that did not involve NOVUS. The training and support from NOVUS has helped us expand our customer base during the first year and we are on track to expand our business with a second technician. We are very happy we made the decision to start our own franchise with an experienced company. While the rewards of business can be great, success is never guaranteed. We made the conscious decision to buy a franchise because we wanted the best name recognition… the best business services… and an established national reputation. NOVUS® offered all these things and more. 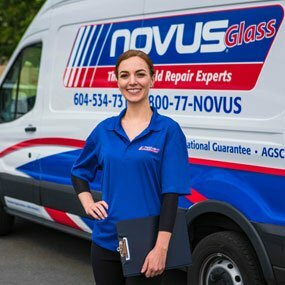 NOVUS Glass is a long-standing, trusted brand that consumers have come to rely on for their windshield repair and replacement needs and is part of the Fix Automotive Network which is Canada’s largest automotive aftermarket services provider. With almost 50 locations across Canada and growing, NOVUS Glass is looking for new partners who share our entrepreneurial spirit and vision. Copyright © 2017. Novus Franchising 2 LLC. All Right Reserved.